How to get coins out of my wallet to another wallet and start trading when it goes live? Is that even possible or is it next to impossible just as the whole mining ether thing? Yep but that wallet has to be there when the trading starts and not when the initial hype is over and the price has dropped again. Hello @arandy, sorry for the late reply, thing are super busy! If you have any questions after that, ping me on Skype (I've pmed you my addy) and I'll be happy to assist you in real time. the ether toturial is far to complex. To many programs in play to make 1 program work. I could skype you but then we will be skyping for a few hours before it's done and i don't think you want that. 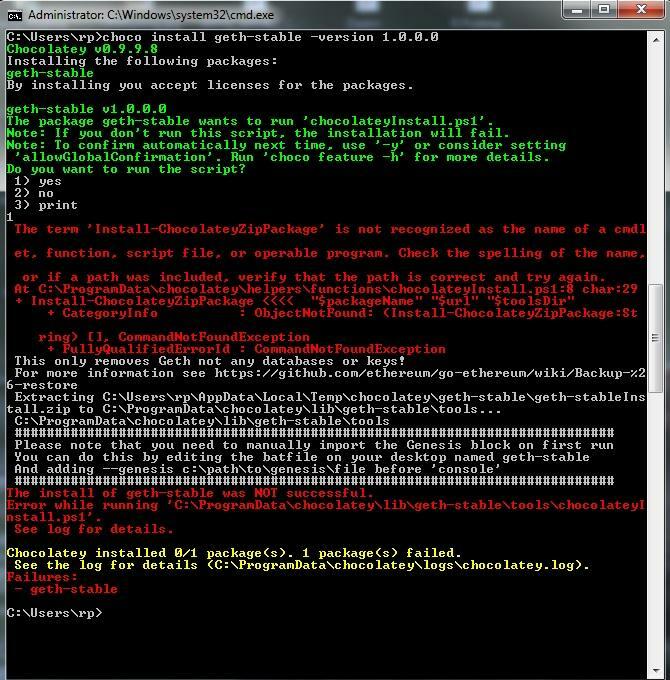 tnx that doesn't sound to hard only problem here is i can't get geth installed with choco. so basicly what i did for windows was use the windows geth that I compiled, if you cant compile dont worry there is a link to a compiled version on the github. once that was up and synced, i ctrl+c'd out of it. So after getting both of those things I can now mine on windows easily. I am lost. I bought ether to fund as the concept is very exciting. However, I am illiterate when it comes to the technical aspect. And the instructions for the wallet are way over my comfort level. Will there be a wallet for dummies so my coins aren't just sitting in limbo, or should I find someone who is more savvy than I to set up my wallet. Scared I'm going to do something and end up loosing my coins. Unfortunately, I've done it before with other crypto's. Way out of my league. This is the Frontier, the whole point is that it's the first release and so not ready for primetime yet - it's meant to be for pioneers! The easy wallet will no doubt be ready for the Homestead release I guess. Selling straight away may well prove to be a bad move anyway. Imagine this is the June 2011 Bitcoin spike and you're really pleased with selling your Bitcoins for $20 each. Then April 2013 comes along..
Could you explain step 7? maybe give an example what to copy and paste in mu cmd window? Yeah, I'm going to attempt to do that too :-) Just wish I'd bought more in the presale! is there any way to move ether from a pre-sale wallet that doesn't take many steps and installing all kinds of programs? I am looking for a way for a regular person with a regular computer to move ether in under 10 minutes.